Official artwork of Kat & Ana from Game & Wario. 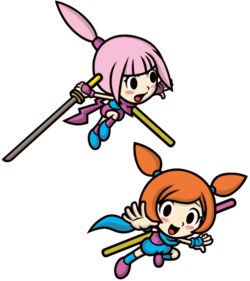 Kat & Ana (カット&アナ, Kat & Ana) are young twin ninjas from the WarioWare series. Combining their names will spell katana, a type of Japanese sword, which strangely enough neither sister uses. Instead, they wield middle-Asian cutlasses. Kat and Ana as depicted in official artwork for WarioWare: Touched! 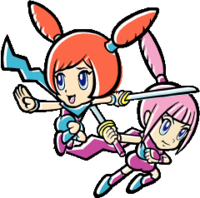 Kat & Ana are recurring characters of the WarioWare, Inc. franchise. They have appeared in every game in the series. In each new title, they offer a different short story with a set of microgames to go with it. Kat & Ana's microgames always focused on one specific type of controller input, such as drawing on the Nintendo DS touch screen in WarioWare: Touched! (Nintendo 3DS in WarioWare Gold), or using the Game Boy Advance's A button in WarioWare, Inc.: Mega Microgame$! and WarioWare: Twisted!. Kat & Ana attacking in Brawl. Kat & Ana appear as Assist Trophy characters in Super Smash Bros. Brawl. 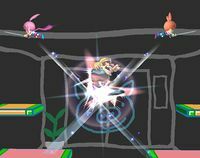 Kat and Ana use a special dance combination, in which they fly in from various locations off-screen and cross over at the summoner's opponent(s). Any characters that make contact with either Kat or Ana will take 10% damage. If Kat and Ana both hit, characters that are caught in the X will take 20% damage. Kat & Ana are the Assist Trophy parallels to the Pokémon Latias and Latios. An interesting fact to note is that their voices are ripped directly from the voice samples in WarioWare: Smooth Moves for the Wii. Upon being summoned, the duo will say either "Ninja!" or "Katana!". Kat & Ana trophy in Brawl. Kat & Ana in Super Smash Bros. for Wii U.
Kat & Ana reappear as Assist Trophy characters, filling the same role they played in the previous game. They now sport their design from Game & Wario. Kat & Ana's trophy is one of the red items in Smash Tour. When it is used before a battle, the user will automatically tech all collisions with walls and ceilings for the duration of that battle. 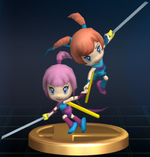 Kat & Ana trophy in Super Smash Bros. for Nintendo 3DS. Kat & Ana trophy in Super Smash Bros. for Wii U. These ninja twin sisters of the Iga Clan attend Diamond City Kindergarten. The high-tech katanas they carry, made by Dr. Crygor, are like an extension of their own bodies. They strike at incredible speed with devastating attacks. By the way, Kat is the one with pink hair. Telling these twin sisters apart is easy: Kat's hair is pink; Ana's is orange. They both go to Diamond City Kindergarten, love nature, and train as ninjas with the Iga clan. In this game, they deliver an impressive joint cross-slash attack with the gigantic high-tech swords Dr. Crygor made them. Although Kat & Ana no longer appear as an Assist Trophy, they do appear together as a Spirit. Kat & Ana operate the Ninja Style Dojo which increases throw power, grab power, item power, move speed, and fall speed, but majorly decreases attack power, special-move power, defense, and weight. Their dojo is found near one of the Spirit Train's stations. Official artwork of Kat & Ana from Brawl. Kat & Ana attacking in Super Smash Bros. for Nintendo 3DS. Kat & Ana are one of five Assist Trophies to have appeared since Brawl, but absent in Ultimate. This page was last edited on February 10, 2019, at 02:15.